43 The learning of the world is built upon a concept of the self adjusted to the world's reality. It fits it well. For this an image is that suits a world of shadows and illusions. Here it walks at home, where what it sees is one with it. The building of a concept of the self is what the learning of the world is for . This is its purpose—that you come without a self and make one as you go along. And by the time you reach "maturity," you have perfected it to meet the world on equal terms, at one with its demands. 44 A concept of the self is made by you . It bears no likeness to yourself at all. It is an idol, made to take the place of your reality as Son of God. The concept of the self the world would teach is not the thing that it appears to be. For it is made to serve two purposes, but one of which the mind can recognize. The first presents the face of innocence, the aspect acted on . It is this face that smiles and charms and even seems to love. It searches for companions, and it looks at times with pity on the suffering and sometimes offers solace. It believes that it is good within an evil world. 45 This aspect can grow angry, for the world is wicked and unable to provide the love and shelter innocence deserves. And so this face is often wet with tears at the injustices the world accords to those who would be generous and good. This aspect never makes the first attack. But every day a hundred little things make small assaults upon its innocence, provoking it to irritation and at last to open insult and abuse. 46 The face of innocence the concept of the self so proudly wears can tolerate attack in self-defense, for is it not a well-known fact the world deals harshly with defenseless innocence? No one who makes a picture of himself omits this face, for he has need of it. The other side he does not want to see. Yet it is here the learning of the world has set its sights, for it is here the world's "reality" is set to see to it the idol lasts. 47 Beneath the face of innocence there is a lesson that the concept of the self was made to teach. It is a lesson in a terrible displacement and a fear so devastating that the face which smiles above it must forever look away, lest it perceive the treachery it hides. The lesson teaches this: "I am the thing you made of me, and as you look on me, you stand condemned because of what I am." On this conception of the self the world smiles with approval, for it guarantees the pathways of the world are safely kept and those who walk on them will not escape. 48 Here is the central lesson that ensures your brother is condemned eternally. For what you are has now become his sin. For this is no forgiveness possible. No longer does it matter what he does, for your accusing finger points to him, unwavering and deadly in its aim. It points to you as well, but this is kept still deeper in the mists below the face of innocence. And in these shrouded vaults are all his sins and yours preserved and kept in darkness where they cannot be perceived as errors, which the light would surely show. You can be neither blamed for what you are, nor can you change the things it makes you do. And you are each the symbol of your sins to one another, silently, and yet with ceaseless urgency condemning still your brother for the hated thing you are. 49 Concepts are learned. They are not natural. Apart from learning, they do not exist. They are not given, and they must be made. Not one of them is true, and many come from feverish imaginations, hot with hatred and distortions born of fear. What is a concept but a thought to which its maker gives a meaning of his own? Concepts maintain the world. But they cannot be used to demonstrate the world is real. For all of them are made within the world, born in its shadow, growing in its ways, and finally "maturing" in its thought. They are ideas of idols painted with the brushes of the world, which cannot make a single picture representing truth. 50 A concept of the self is meaningless, for no one here can see what it is for and therefore cannot picture what it is . Yet is all learning which the world directs begun and ended with the single aim of teaching you this concept of yourself, that you will choose to follow this world's laws and never seek to go beyond its roads nor realize the way you see yourself. Now must the Holy Spirit find a way to help you see this concept of the self must be undone if any peace of mind is to be given you. Nor can it be unlearned except by lessons aimed to teach that you are something else . For otherwise you would be asked to make exchange of what you now believe for total loss of self, and greater terror would arise in you. 51 Thus are the Holy Spirit's lesson plans arranged in easy steps that though there be some lack of ease at times and some distress, there is no shattering of what was learned, but just a re-translation of what seems to be the evidence on its behalf. Let us consider then what proof there is that you are what your brother made of you. For even though you do not yet perceive that this is what you think, you surely learned by now that you behave as if it were. Does he react for you ? And did he know exactly what would happen? Could he see your future and ordain before it came what you should do in every circumstance? He must have made the world as well as you to have such prescience in the things to come. 52 That you are what your brother made of you seems most unlikely. Even if he did, who gave the face of innocence to you? Is this your contribution? Who is, then, the "you" who made it? And who is deceived by all your goodness and attacks it so? Let us forget the concept's foolishness and merely think of this—there are two parts to what you think yourself to be. If one was generated by your brother, who was there to make the other? And from whom must something be kept hidden? If the world be evil, there is still no need to hide what you are made of. Who is there to see? And what but is attacked could need defense? 53 Perhaps the reason why this concept must be kept in darkness is that in the light the one who would not think it true is you . And what would happen to the world you know if all its underpinnings were removed? Your concept of the world depends upon this concept of the self. And both would go if either one were ever raised to doubt. The Holy Spirit does not seek to throw you into panic. So He merely asks if just a little question might be raised. 54 There are alternatives about the thing that you must be. You might for instance be the thing you chose to have your brother be. This shifts the concept of the self from what is wholly passive and at least makes way for active choice and some acknowledgment that interaction must have entered in. There is some understanding that you chose for both of you, and what he represents has meaning that was given it by you. It also shows some glimmering of sight into perception's law that what you see reflects the state of the perceiver's mind. Yet who was it that did the choosing first? If you are what you chose your brother be, alternatives were there to choose among, and someone must have first decided on the one to choose and let the others go. 55 Although this step has gains, it does not yet approach a basic question. Something must have gone before these concepts of the self. And something must have done the learning which gave rise to them. Nor can this be explained by either view. The main advantage of the shifting to the second from the first is that you somehow entered in the choice by your decision. But this gain is paid in almost equal loss, for now you stand accused of guilt for what your brother is. And you must share his guilt because you chose it for him in the image of your own. While only he was treacherous before, now must you be condemned along with him. 56 The concept of the self has always been the great preoccupation of the world. And everyone believes that he must find the answer to the riddle of himself. Salvation can be seen as nothing more than the escape from concepts. It does not concern itself with content of the mind, but with the simple statement that it thinks . And what can think has choice and can be shown that different thoughts have different consequence. So it can learn that everything it thinks reflects the deep confusion that it feels about how it was made and what it is. And vaguely does the concept of the self appear to answer what it does not know. 57 Seek not your Self in symbols. There can be no concept that can stand for what you are. What matters it which concept you accept while you perceive a self which interacts with evil and reacts to wicked things? Your concept of yourself will still remain quite meaningless. And you will not perceive that you can interact but with yourself. To see a guilty world is but the sign your learning has been guided by the world, and you behold it as you see yourself. The concept of the self embraces all you look upon, and nothing is outside of this perception. If you can be hurt by anything, you see a picture of your secret wishes. Nothing more than this. And in your suffering of any kind, you see your own concealed desire to kill. 58 You will make many concepts of the self as learning goes along. Each one will show the changes in your own relationships as your perception of yourself is changed. There will be some confusion every time there is a shift, but be you thankful that the learning of the world is loosening its grasp upon your mind. And be you sure and happy in the confidence that it will go at last and leave your mind at peace. The role of the accuser will appear in many places and in many forms. And each will seem to be accusing you . Yet have no fear it will not be undone. 60 I do not know the thing I am and therefore do not know what I am doing, where I am, or how to look upon the world or on myself. 61 Yet in this learning is salvation born. And what you are will tell you of Itself. 1 How foolish, Father, to believe Your Son could cause himself to suffer! Could he make a plan for his damnation and be left without a certain way to his release? You love me, Father. You could never leave me desolate, to die within a world of pain and cruelty. How could I think that Love has left Itself? There is no will except the Will of Love. Fear is a dream and has no will that can conflict with Yours. Conflict is sleep, and peace awakening. Death is illusion; life, Eternal Truth. There is no opposition to Your Will. There is no conflict, for my will is Yours. 2 Forgiveness shows us that God's Will is one and that we share it. Let us look upon the holy sights forgiveness shows today that we may find the peace of God. Amen. 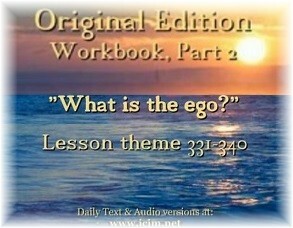 This Lesson starts with a new question, "What is the Ego?" (W.PII.Q12) People talk about loving or hating the ego, but no one can say it belongs to them, for it is the separated self. Yet it feels like this is our identity. The ego’s chosen home is the body and as long as we identify with the body, we will think it is our reality. It is the self we think we are with a separate will and our own private thoughts. Jesus tells us that the ego is idolatry, meaning the worship of a false god, the false self we have come to identify as "me," which we value and think of as the central character in this illusory dream. The miracle "merely looks on devastation, and reminds the mind that what it sees is false." (W.PII.Q13.What is a Miracle?1.3) The miracle is opposite to the ego because, in the experience of the miracle, we see all that the ego appeared to be. When we ask why did we separate, and how did all of this happen, we need to "Hear, then, the one answer of the Holy Spirit to all the questions the ego raises: You are a child of God, a priceless part of His Kingdom, which He created as part of Him." (T.6.IV.6.1) (ACIM OE T.6.V.50) This answer to the ego is already in our minds. In the question, why did we separate, there is an assumption that we did. However, contained in the question is a statement that is incorrect. The separation never happened. When we identify with the ego, we invest allegiance to a substitute for the Christ Self. We have made a will, a self, and a body in opposition to God, Who we now see as the enemy. We fear this god, who is made in our own image---a wrathful, punishing, and jealous god. The ego made up a god to fear so we would keep our allegiance to it (the ego). It is this god the ego made that is perceived at war with us. It is this image of an angry God that we have run away from, hiding in the body and the world where we think we are safe from His wrath. We now see God as having abandoned us to suffer and die in a cruel world. We cry out, "God, why have you abandoned me?" Yet, in truth, we are the ones who have abandoned Him, and now we project onto Him our own decision to leave Heaven. We see Him as having almighty power, which makes us powerless victims, subject to His treatment of us. We experience suffering and ask, "God, why did you let this happen to me?" as if God were responsible for our condition. That is how the ego set it up---so our fear of God and His all-consuming love would keep us from abandoning the ego. But the ego is really just a fear thought to which we have given the attributes of love. In other words, we now look to fear for protection when in truth our only real protection is God's Love. The core of the ego thought system is one of having defeated God and of having established our own reality. But our existence is challenged when we experience a glimpse of eternity, which is the holy instant. It is a moment from outside this dream. With each holy instant, we come to see that the dream has no reality and never did. Reality is egoless. God is not part of this ego insanity. In each moment, we have a choice---to identify with the insanity of the ego or to choose forgiveness and peace. Every time we accept that we are mistaken in our way of perceiving and instead choose to forgive, we experience a reflection of Heaven until the dream is no more. Lesson 331 is, "There is no conflict, for my will is Yours." Our experience in this world is full of conflict, yet conflict only comes from the split mind. There is a part of the mind that identifies with the ego and another part that is a reflection of the Christ. We project the thought system of strife and conflict that we hold in our wrong mind onto the world. Thus, we experience a world of conflict and conflicted relationships. It is a thought system of "one or the other," God or me, which came about with the separation. Only the wrong mind holds thoughts of conflict. In this dream, we can and do experience conflict, but the truth is that there is only One Will, and we share that Will with God. God is not even aware of our experience in this dream. The conflict we think is there with God is one of opposition and defiance that originated with our opposition to God. It is the authority problem that is the source of all our conflicts in the world. In fact, Jesus tells us, "The authority problem is still the only source of conflict, because the ego was made out of the wish of God's Son to father Him." (T.11.In.2.3) (ACIM OE T.10.1n.1.2) You could call it the self-made man where we made our own father. When looked at with perfect honesty, Jesus says we would see this. He says that we never look at anything with perfect honesty and keep this thought hidden from ourselves. That is why he unveils for us how the ego has set all this up, so we can look honestly at what we have seemingly done and question it all. "The more you approach the center of His thought system, the clearer the light becomes." (T.11.In.3.4) (ACIM OE T.10.II.3) We must look at the darkness of the ego thought system and be willing to "Open the dark cornerstone of terror on which it rests, and bring it out into the light." (T.11.In.3.9) (ACIM OE T.10.II.3) We are not alone. The spark of love in us goes with us to light the way. We are called to bring all conflict to the quiet Presence in our right mind. This requires courage and great honesty. Because we are now aware of two thought systems in our mind, the conflict in our lives may seem to increase after the initial experience with the Course. Life no longer seems as simple as when we listened almost exclusively to the voice of the ego. In "The Lessons of the Holy Spirit" (T.6.V) (ACIM OE T.6.V.a To Have Give All To All) Jesus makes it clear that our invitation to the Holy Spirit brought more conflict. Do we choose the ego or the Holy Spirit? We now see that we have two mutually exclusive options. Now when we attack, we feel even more distress because increasingly we see that our judgments and attacks on others only bring more guilt and pain. We know that we should forgive, yet we hold grievances. We want retribution for what others have done to us, yet we want to heal our mind. Thus, our mind is going in two different directions, and we experience a lot of conflict. We despair that we will never achieve our spiritual goal, but only the ego can experience this kind of hopelessness. The Holy Spirit is certain, and Jesus assures us of our awakening as we increasingly learn to listen only to the right mind. I remember clearly as a young child of about 5 years of age. I was living in Sweden in a refugee camp, deciding that I was on my own and had to look after myself. I felt very vulnerable and believed there was no one who could protect me. Later in my life, as I revisited this time in my memory, I realized I had made a decision to rely on myself rather than God. I became very independent, very strategic, and very political, believing my survival and success in the world was entirely up to me. It was me against the world. My inner child was very indignant at the atrocities in the world and I carried this indignant child for a long time. I railed against injustices and fought for the underdog. I tried to make right what I perceived as wrong in my relationships and in the world. There is no peace in this stance I took. I perceived no safety in vulnerability, but I later realized that it was only in being vulnerable that love could be given and received. What a relief to realize, through this journey with the Course, that I could give up this fight with God. He tells us it is simply foolish to believe we could oppose God's Will. It is foolish to think I could have done anything to corrupt or change myself in any way. This new awareness has helped me to relax and to go with the flow, recognizing all things truly do work together for our good and that there are no victims or victimizers. There is value in everything that seems to happen to us, as it can all be used to help us in our awakening if we use every situation for that purpose. Imagine if we looked at every situation and every person with holy sight---with the eyes of Christ---and saw only innocence. That is what forgiveness shows us. With forgiveness, we see only the holy. We see only God's Will for us. We see that our brother is our Self, and experience no separation. We are the same Self. We do not try to interfere with anyone's classroom, thinking we know what others need; nor do we correct anyone's ego, but only work to accept the Correction for ourselves. If we truly want to know the Self we are, we need to look at the patterns in our lives, how we defeat ourselves, and how we attract whatever we are running away from in ourselves. It is important not to fight the ego, not to indulge it, nor to love it. We are merely asked to look at it and be willing to take full responsibility for it, rather than to project our own self-attack onto others. This takes courage. We tend to live in the upper rooms of our home, denying what is in the basement. We don't want to acknowledge our own shadow, but we prefer to see it in others and judge it there. Now we are asked to look into the dark corners where we have closed the doors tight and placed sentinels outside those doors to guard those rooms and keep us from investigating what is in them. Healing requires that we look there and bring our defenses to the light, even though the process brings up a lot of fear. Jesus assures us, we never go there alone. We need not be afraid of the ego. It is nothing, though it seems to us to have a lot of power; yet the only power it has is what we give it. Have you ever had the experience of keeping a shameful secret that has tormented you and controlled you, and there was a lot of fear that you would be found out? Then, when you finally opened the door to that dark secret room in your mind and allowed the light to shine in, all the shame and all the power it contained were gone. It never had any power to control you, except for your belief it had to be hidden and defended. How do we discover what we are hiding? Sometimes, we don't even know what is there, but we can see it in our projections. When we "hate" something about someone else, we can use this projection as an opportunity to look at some version of that same thing we hate about ourselves. Unmasking the ego is what this process is about, and it is the only way to heal. The ego is all about fear. It has been running the show while our attention was elsewhere. We try everything to keep ourselves safe and guarded against discovering the love beyond the fear. We have invested in defenses, believing they keep us safe. Yet the more defenses we erect, the more afraid we feel. Now, we are invited to look at our ego strategies and conspiracies against our own happiness and surrender them. We are not responsible for the purification. Our only responsibility is to bring the darkness to the light. Healing is what the Holy Spirit does from outside our belief system. That is the truth, but it is not to cover the feelings that are there. Those should be acknowledged, explored, investigated, felt, expressed, and released. The ego's strategy is to try to resolve it, but that puts the ego in the forefront. The Holy Spirit's answer is to release it. It does not matter how long it takes because this is what time is for. Any conflict we feel is simply not the truth. The truth is that the Son of God cannot suffer. The will we have identified with is nothing but fear. It will simply vanish as we keep cleaning out the basement of the unconscious mind.